I was recently hired to design a kitchen for a large space, which will incorporate two connecting rooms. The home has its architectural challenges, of which I could mention a bunch off the top of my head. 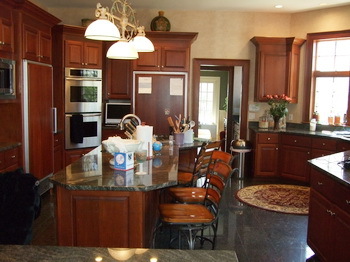 Currently, in this huge kitchen, there is about 36" between the island and the main "run" of cabinets. 36" in a huge kitchen. That really makes sense...no, it doesn't. Part of what I find to be a lot of fun, is when I go into a home, look at the existing kitchen, and I can see the thinking, the motivations, of the previous kitchen designer. I do enjoy making lots of mini observations, connecting the pieces, to figure out how and why the kitchen was created in its original form. And, I could be way off base, too, with my assumptions, sometimes, but, it's a fun, little, exercise. And, of course, one never knows who really drove a design, the designer or the client. Here is the empty plan of the existing space. 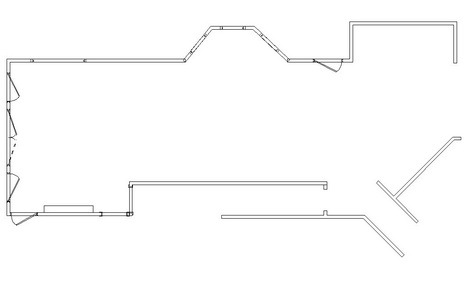 I'll tell you...you draw it out, put in windows, doorways, double check measurements, etc. You're done, after some hours, and then you stop, look at this (in this case, big) empty space in front of you, take a deep breath, and say, here it begins...turn on the inspiration, here we go, find the inspiration, find it, but don't force it, don't rush it, let it flow. Rushing tamps down creativity. Time breeds creativity. This point is sort of a red stop light, a pause, before the light turns green. It's an interesting feeling. It's a natural pause for me. I do a variety of plans to suit a space. I've already come up with several plans I'm quite pleased with, thus this post. I've also cautioned the clients to keep an open mind (a really open mind) because what I'm coming up with is very different from what they have now! I'm excited about the possibilities for this kitchen and surrounding spaces. They will be able to choose the one plan they like from more than several they will be shown. it defines the term "hodge podge"
Here are existing kitchen images, notice the ins and outs and very small areas between very, very large, tall, pieces. 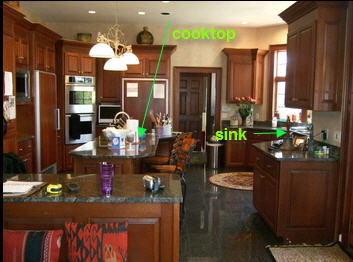 Notice the sink is unconnected to other countertop areas. It just looks, to my eye, very disjointed, not making sense, any sort of flow.